Think the trend is your friend? 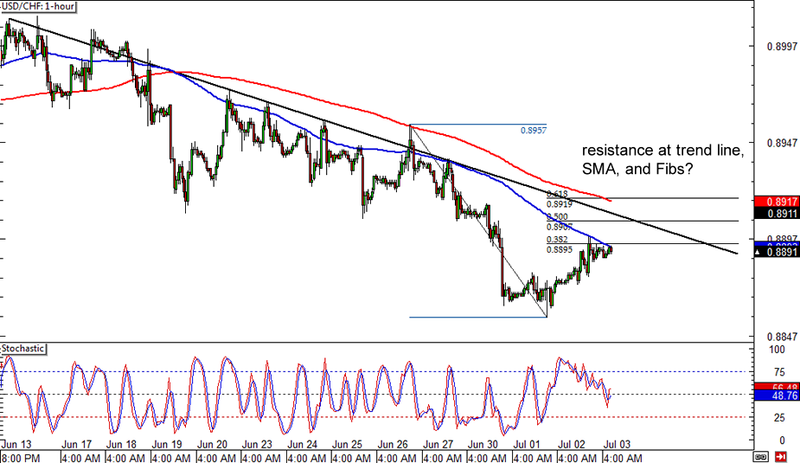 Then this USD/CHF downtrend setup is just for you! 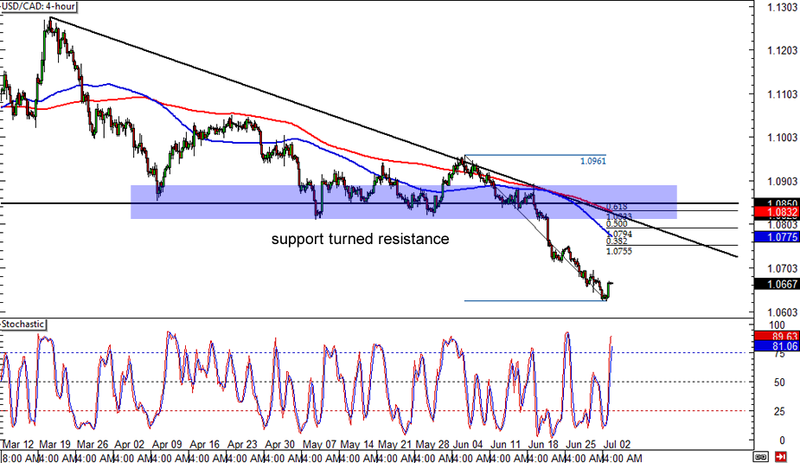 The pair is showing signs of retracing on its 1-hour forex time frame and it might just pull up to the falling trend line connecting its highs. The 38.2% Fib lines up with the 100 SMA, which means that it could hold as resistance, especially with stochastic already moving lower. A higher retracement could last until the 50% Fib and the .8900 major psychological level or right until the 61.8% Fib, which lines up with the 200 SMA and trend line. Can’t decide where to enter? Scaling in is always an option! Here’s another potential retracement play on USD/CAD. A falling trend line can also be drawn to connect the pair’s recent highs on the 4-hour forex chart, with the Fibonacci retracement levels lining up with major and minor psychological levels. In particular, the 50% Fibonacci level lines up with the 1.0800 major psychological handle and the 100 SMA, which makes it a potential resistance area. Stochastic is already in the overbought area but hasn’t crossed down yet, which suggests that there could be enough buying momentum to lead to a shallow retracement for USD/CAD. If longer-term setups are your thang, then you should feast your eyes on this AUD/CAD test of a major area of interest. 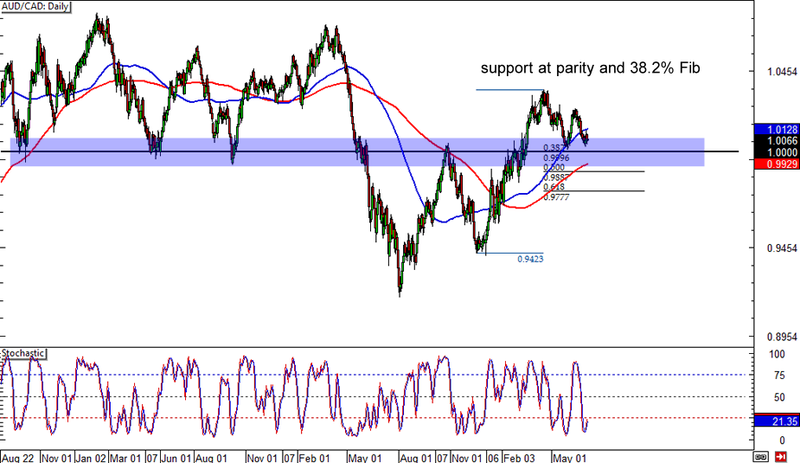 The pair is hovering close to parity, which happens to be right around the 38.2% Fib of the latest swing high and low on the daily forex time frame. Stochastic is just starting to turn up from the oversold area, indicating that bulls could come charging in sooner or later. A bounce off parity could lead to a test of the previous highs around 1.0200, but make sure you set your stop below the 200 SMA if you’re planning to go long.